This slideshow is a biodiesel travelogue of a road trip from my house in Portland, Oregon to my cousin’s wedding near San Diego, California. 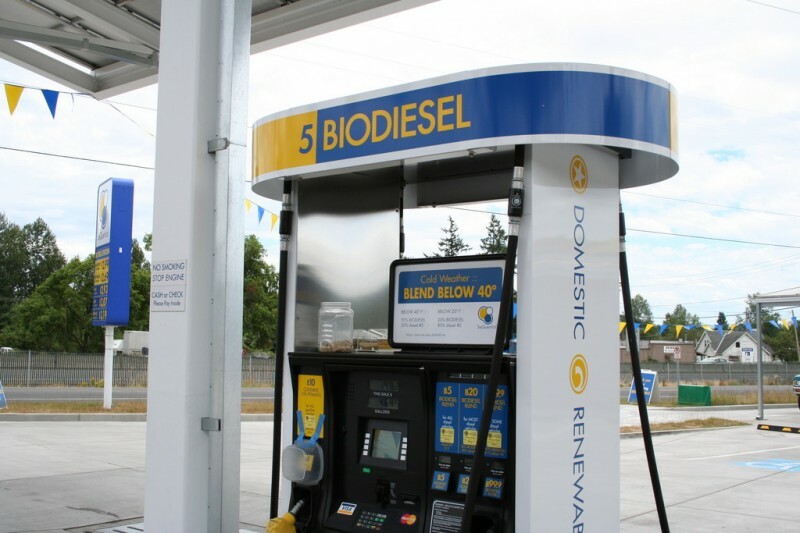 It was a bit of a challenge because there are very few retail biodiesel stations (none that I could find) along I-5 between southern Oregon and Los Angeles, so for the trip down I decided to detour into the Bay Area, where biodiesel seems to be plentiful. 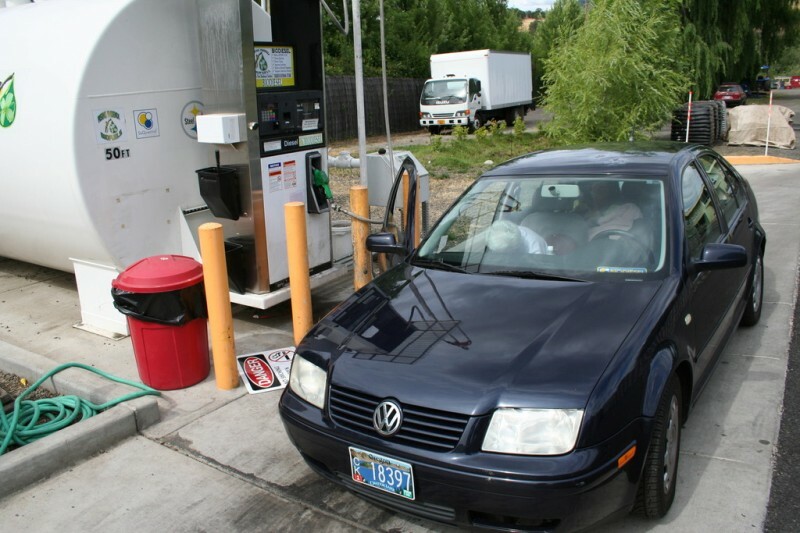 On the way back up to save time we decided to stick to I-5, and as a result had to get about five gallons of petro-diesel to tide the car over until we were back in the wonderful biodiesel filled state of Oregon. So, here is a map of the spots where we stopped. If you click one of the names it will take you to the website for that station or company. [Edit: Note that Bluesky Fuel sadly no longer exists, so I removed that link]. If you have time to check them out they are pretty interesting. When you’re done checking those out, hide this this intro and you can check out out the photos and read a little more about the trip. 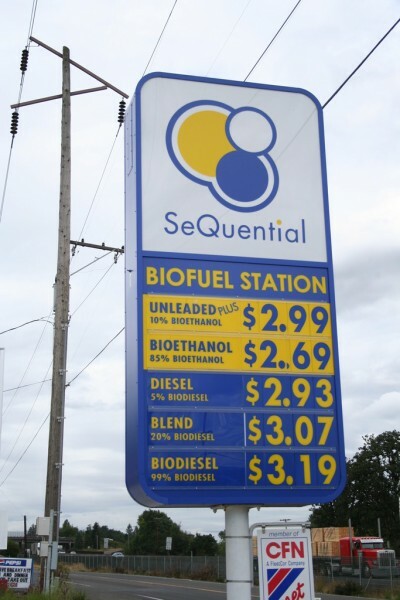 Our first stop on the road was the SeQuential Biofueling Station in Eugene, OR. I had read about this place for a long time and always wanted to stop. 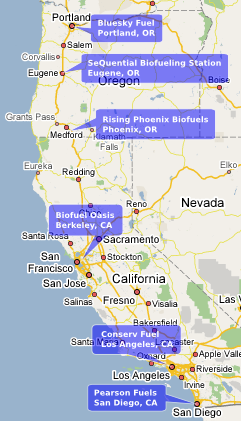 SeQuential Biofuels seems to have single-handedly made Oregon into a place where biodiesel is abundant. They make their fuel out of recycled cooking oil, which is the most environmentally friendly way to make it, because it doesn't require extra crops to be grown just for that purpose. This station is all around friendly to the environment. Notice the recycling bins to the right of the garbage can. You don't find that at an average gas station. 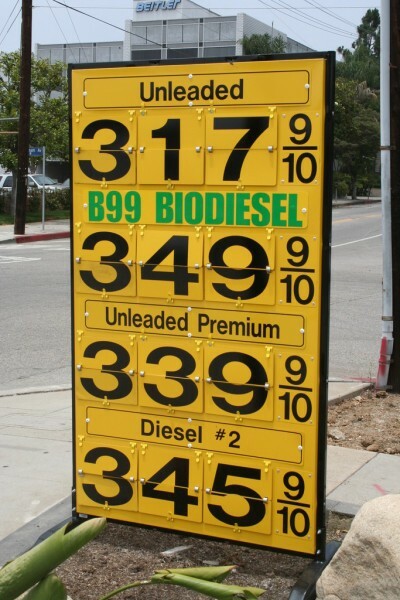 On the biodiesel pumps you could choose from B5, B20 or B99. I use B99 in my car, which is 99.9% biodiesel and 0.1% petro-diesel (regular diesel #2). In Portland, currently the Tri-Met lift buses use B5, and will hopefully be increasing the percentage of biodiesel in the future. 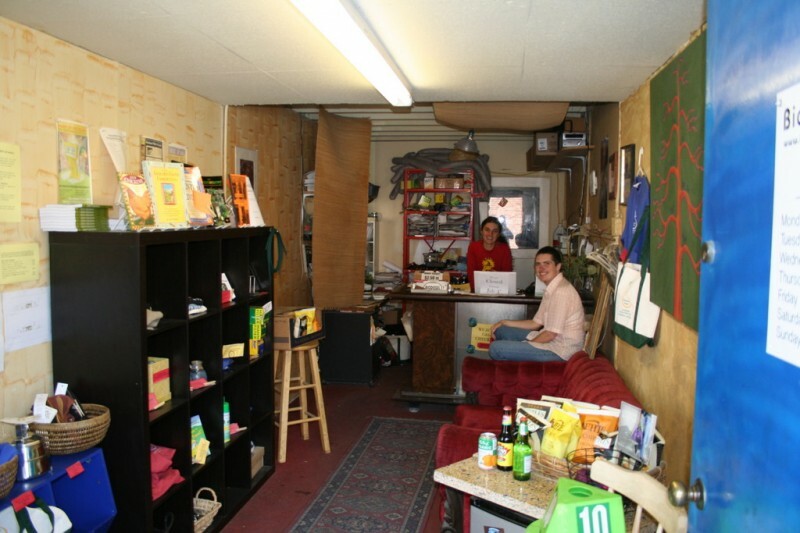 The little convenience store at the station has an organic espresso bar and is stocked with natural foods and beverages. It also features a "Living Roof" that is covered with plants that absorb and use the rainfall instead of letting it run off and carry pollutants from the pavement into the storm drains. Pretty cool. Also, I don't think I have a photo of it, but the roof over the pumps is covered with solar panels that provide about half of the power the station needs. 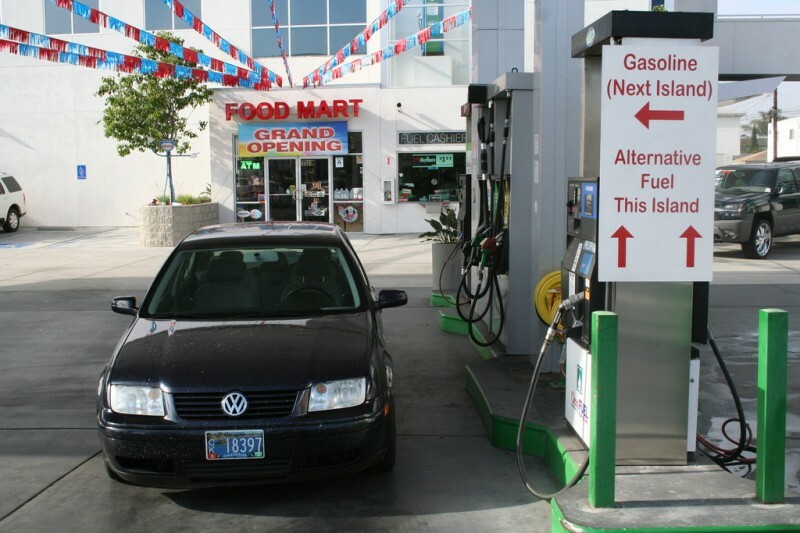 As you can see, they also have ethanol. I believe they have E10 and E85. 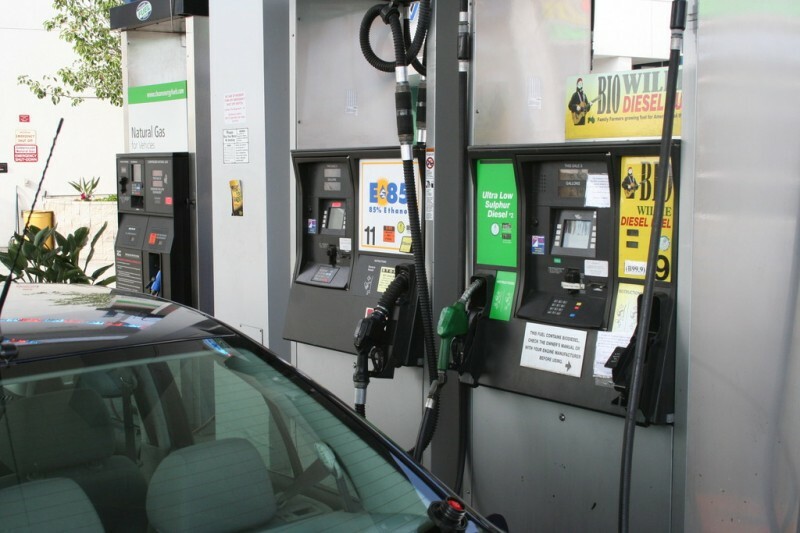 E10 is just a little more ethanol than a standard summer blend of gasoline at a regular station and can be used in normal gasoline engines. 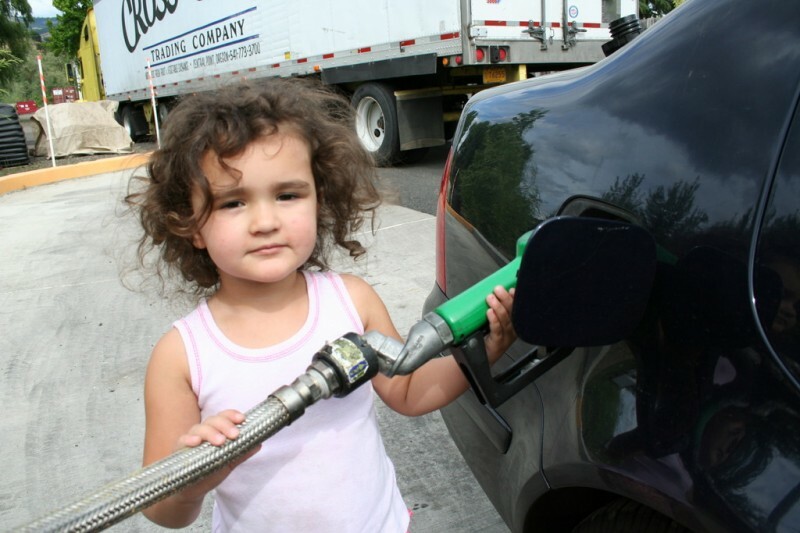 E85 is the fuel that can be used in any of the many Flex Fuel vehicles that are being produced today. Here is the price list. It was so cool to see an entire station that served biofuels. Until then I had only seen one real commercial station out near 181st and Division in Portland, but it was a regular gas station that just added B99 to their lineup. This place was really neat. 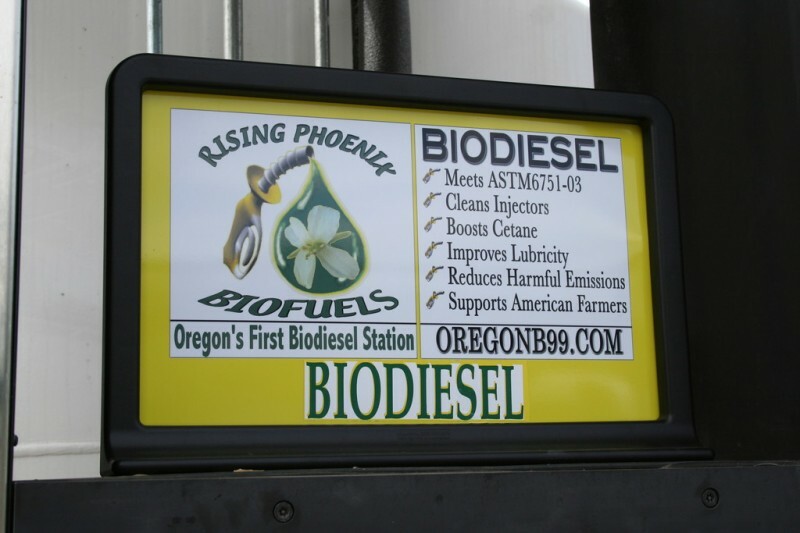 Our next stop was Rising Phoenix Biofuels in Phoenix, OR, pretty close to Medford, about a half an hour or so from the border with California. 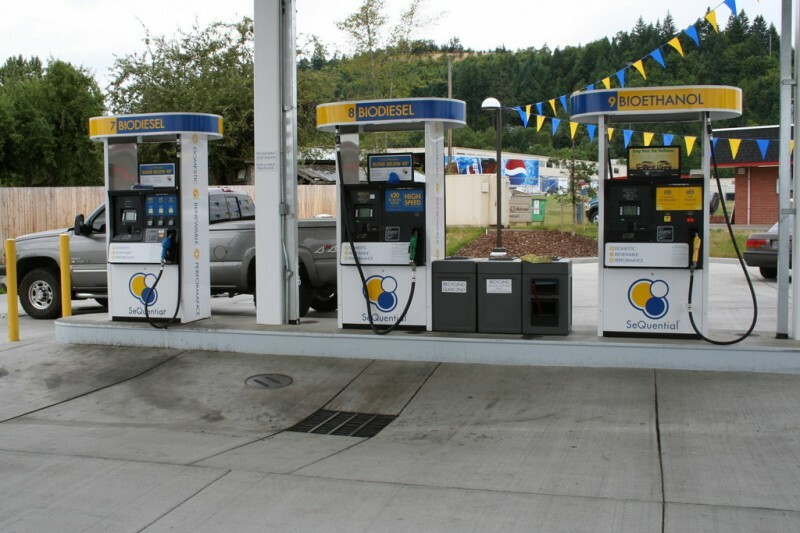 This place claims to be the first biodiesel pump in Oregon. I believe it's a 24 hour pump operated by Visa / MC. 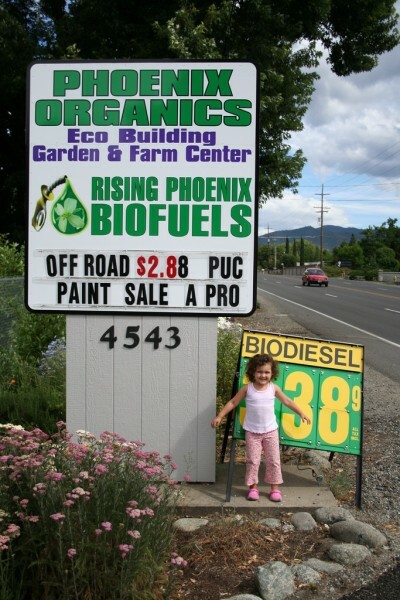 It is part of a company called Phoenix Organics that sells natural building products and organic gardening plants and supplies. It was a really neat place. My niece Allie was excited to get out of the car and have her photo taken as many times as she could. 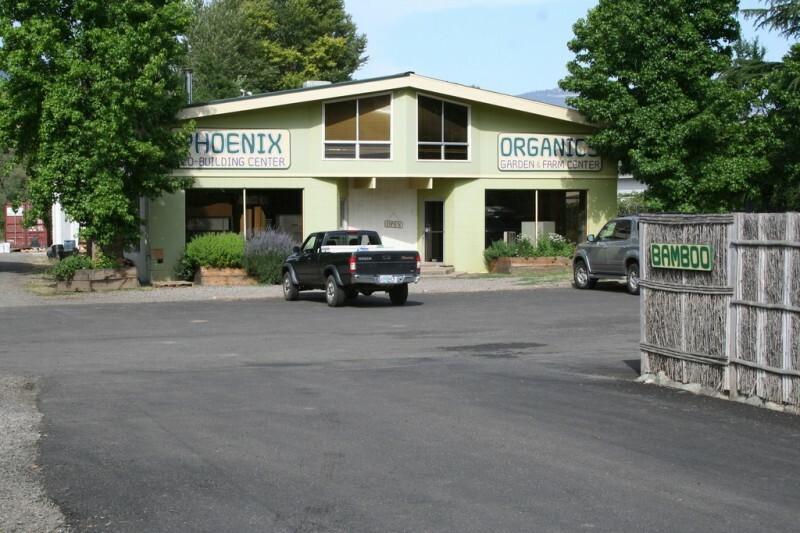 Here is the building that houses the Phoenix Organics showroom of eco-building supplies. We didn't stop in there on the way down, but on the way back we went in to check the place out and I took this photo. On the right you see a wooden fence. Behind that fence is a small nursery. The price was a little higher than what I pay in Portland (that's a three behind Allie), but not too bad for B99. 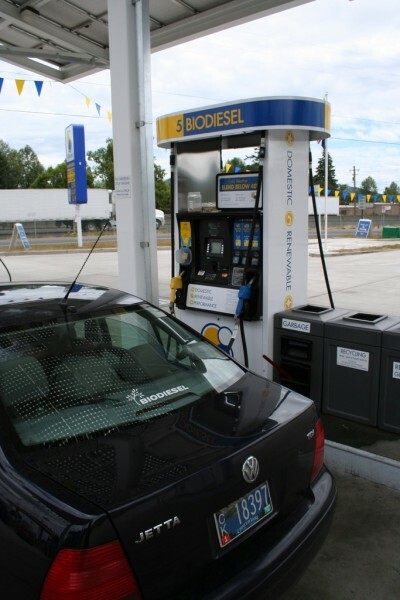 If you're not very familiar with biodiesel you might wonder why it's so expensive, and if it's more expensive than gas, why would you use it. Well, there are a plethora (I love using that word) of environmental and political reasons to use it, but it actually does end up being more economical than an equivalent gas powered car, because diesel engines are more efficient. 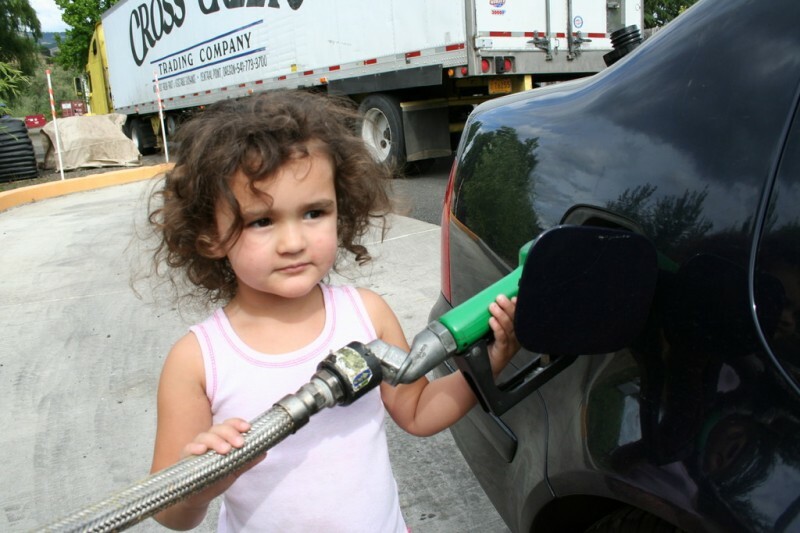 And when you use biodiesel instead of regular, you are doing the environment a favor at the same time. Just as an example, my car gets about 38 miles to the gallon in the city, as opposed to my old car, a Hyundai Accent (small car) that got maybe 25 at best. So, I'm paying a little more per gallon, but saving money overall and feeling good about it. Allie thought this sign was cool looking. Or perhaps her Uncle David did. This was the sign to the left of the pump with instructions and info. It's cool that the tank is heated because biodiesel gels (gets too hard to flow) when the temperature gets near freezing. 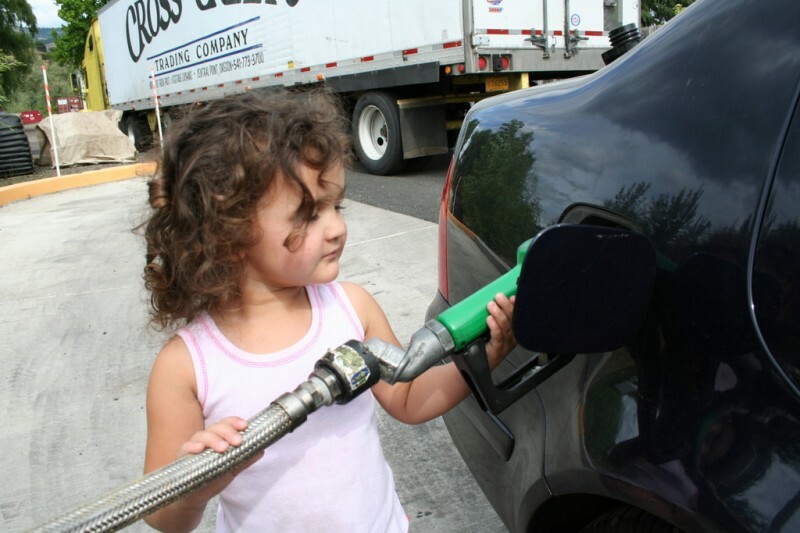 You can overcome this problem by mixing in some regular diesel (50% or less works well in the normal cold temperatures Portland gets at coldest in the winter), but if the biodiesel tank is not heated then you have a problem getting the 50% biodiesel to mix. Here's my car getting ready to be filled up. That's a pretty big above ground tank, huh? 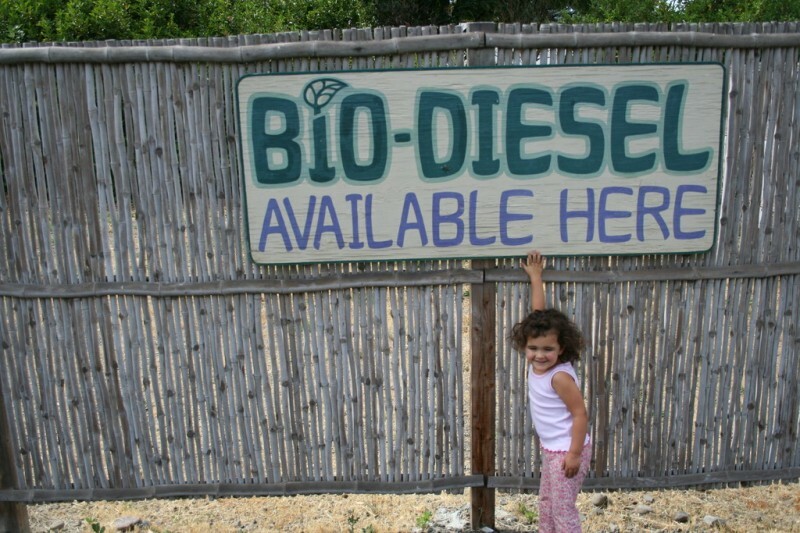 Allie was proud to be filling up with biodiesel. She was pretty sad when we couldn't find any on I-5 on the way back up until we got back here. I wish I had recorded her; it was hilarious. 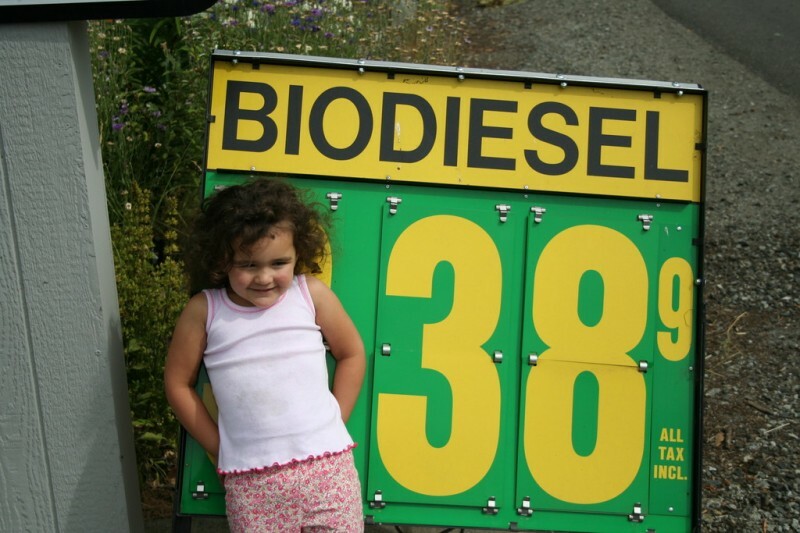 She said something like "Uncle David couldn't find any biodiesel" in a very concerned and serious voice. She was a great traveller. I think it's done, Uncle David. It looks like at least some of their fuel comes from SeQuential. 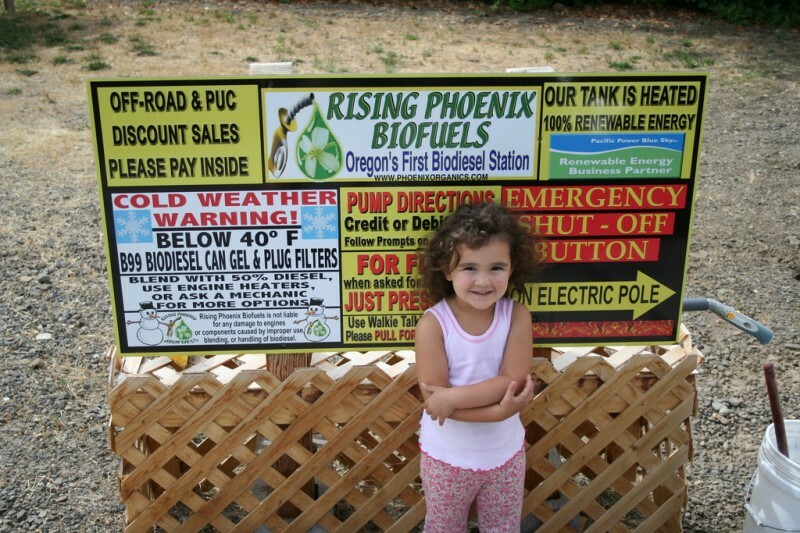 This sign and the website is where I learned that Rising Phoenix was the first biodiesel pump in Oregon. Pretty cool. 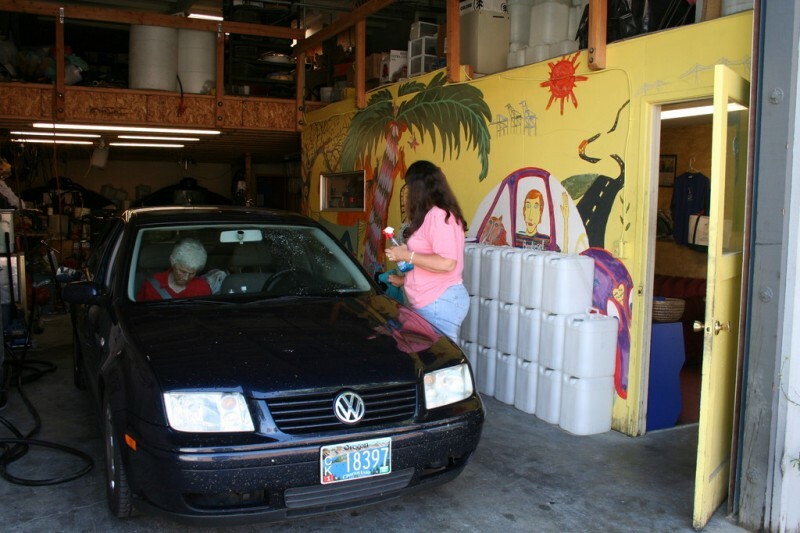 Our next stop was the next morning after we had detoured into Berkeley, CA and spent the night. 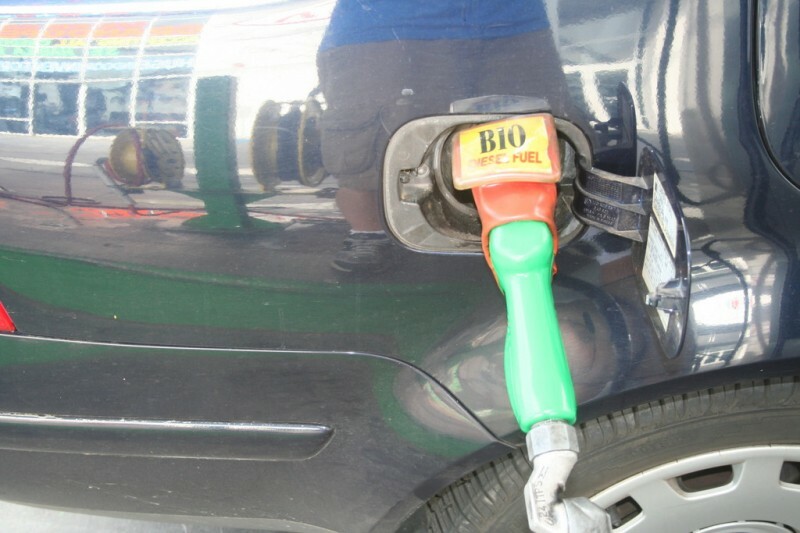 There are no retail biodiesel pumps right off of I-5 that I could discover between southern Oregon and the LA area, so when I planned the trip I planned to make a stop at one of several biodiesel stations in the San Francisco Bay Area, Biofuel Oasis. This place was located near what I assume is the main street through Berkeley. It is actually an indoor pump which was kinda unique. My mom is kindly washing the windows while I fuelled up, which was a much needed service at that point. There was a mural painted on the wall on the right inside. Overall the place had a cool atmosphere. A better view of the mural. Here's what the place looked like from the outside with their sign. To the right of this was the door to the office. They have certain regular hours, but on Fridays (the day I was there) you are supposed to call ahead to make an appointment. So, my appointment was at 10:30 and two of the owners/operators were there to help me out. 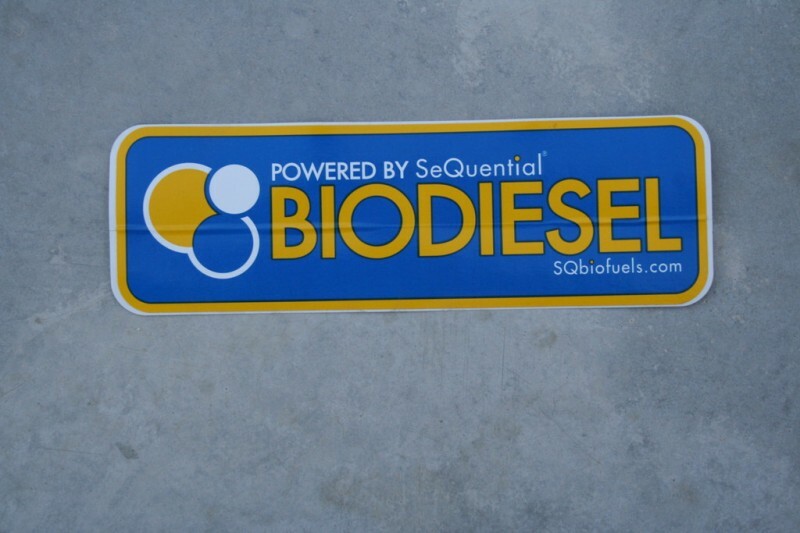 The office was filled with biodiesel paraphernalia including books and t-shirts. They also had a small cooler with a few natural sodas and juices. 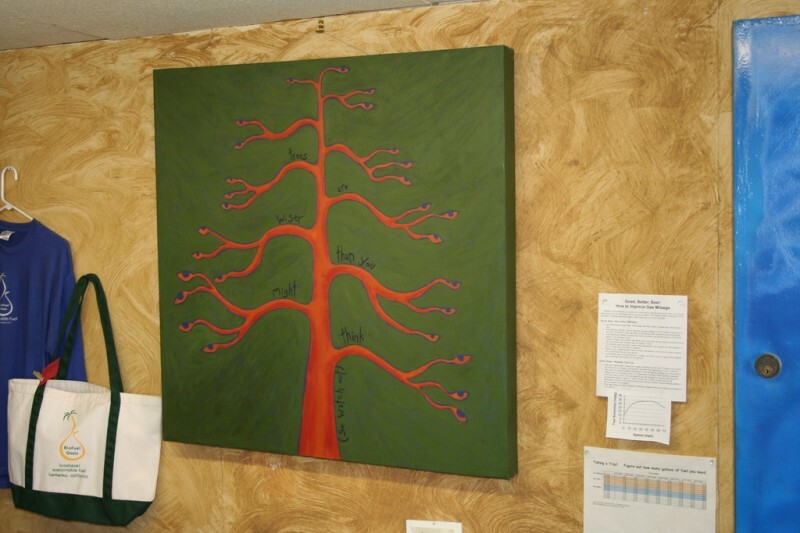 They had this painting on the wall that reads "Trees are wiser than you think (so watch out)." Overall it was a very cool, unique place. 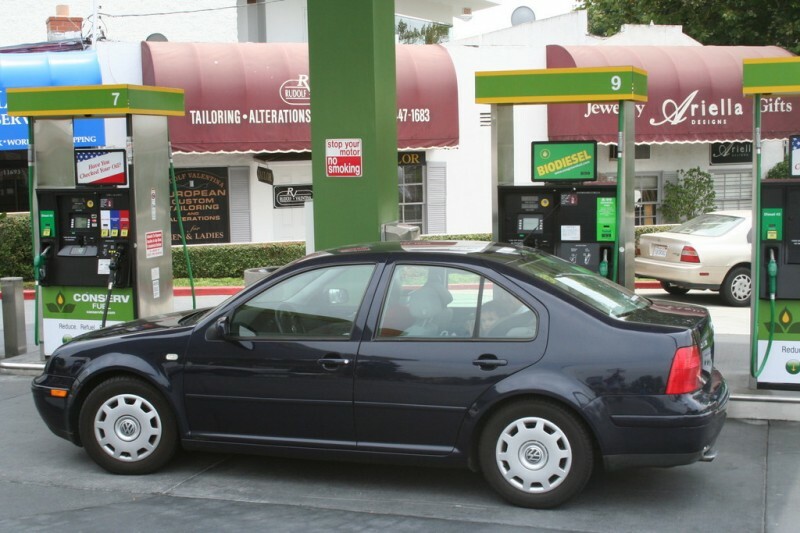 When we got down to our hotel near Solana Beach, CA, we had enough fuel to get around for a while, but when it was time to head back up to our cousins' house in Pasadena, I decided to find a station in the San Diego area. Thankfully I found Pearson Fuels in San Diego proper. It was about a thirty minute each way trip in the wrong direction, but I was glad to find it and to have enough fuel to make it up to Pasadena and to drive around while we were there. They featured Willie Nelson's brand of biodiesel, BioWillie. :) Funny. 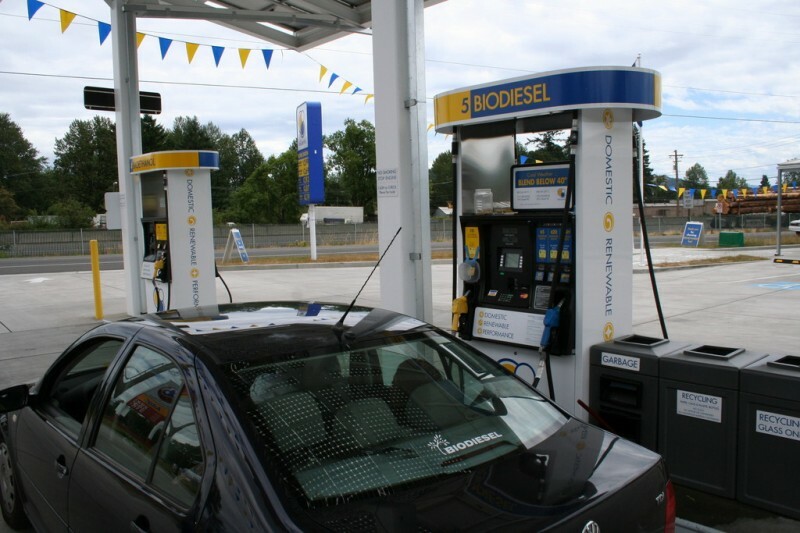 I'm really not used to going to commercial stations to fill up, so a couple of times on this trip I pulled up to the pump with my "biodiesel cap" on the wrong side. Here was their price list. 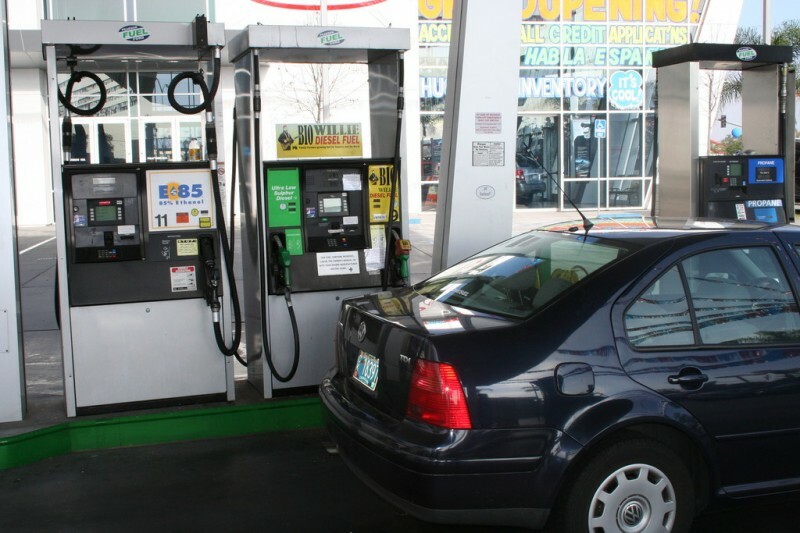 Notice they also have ethanol and natural gas in their line-up of alternative fuels. 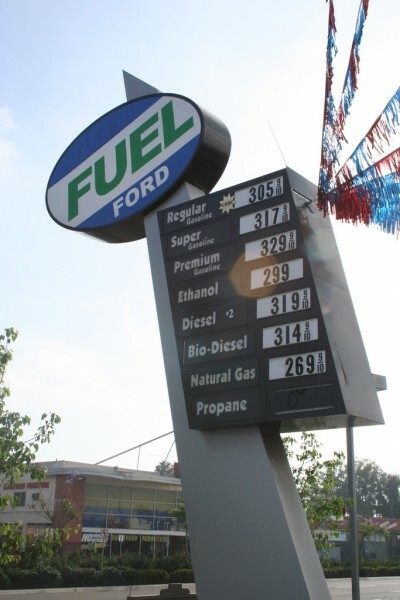 Oh yeah, and their biodiesel price was the best I found. I was really surprised it was so cheap there. It was super expensive in Berkeley--like $3.85 or something crazy like that. So yeah, this was refreshing. 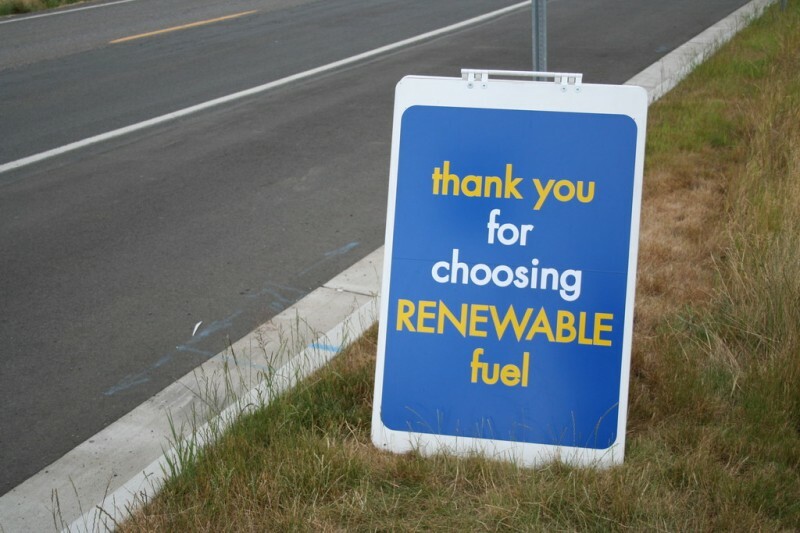 I chose the alternative fuel island. This was sort of a weird thing on the pump handle, and incidentally, the reflection on my car is the only photo of me in this set. As usual, I'm wearing my Wanderlife shirt that my friend Tyler made. 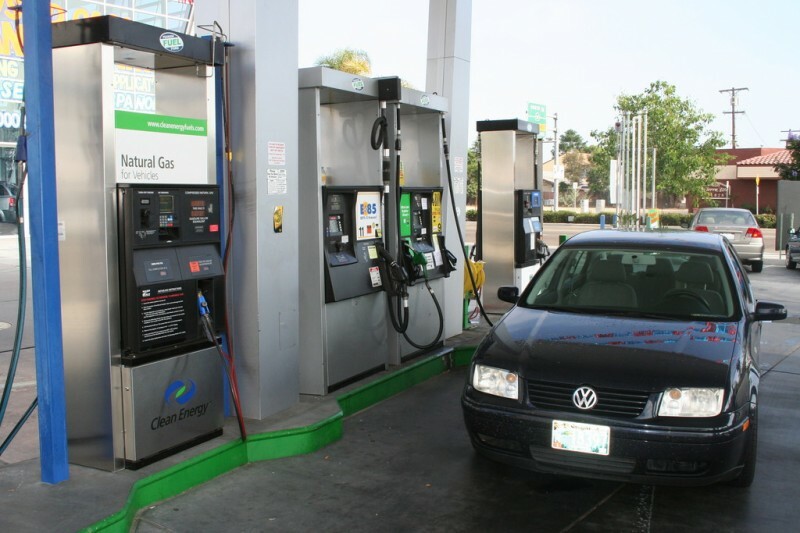 The alternative fuel island offered BioWillie Biodiesel, Ultra-Low-Sulphur Diesel #2, E85 Ethanol and Natural Gas. This is the first time I've seen a pump for Natural Gas for Vehicles. I have seen cars and trucks around Portland that said that they were run on Natural Gas, but yeah... never knew where they got it. I guess they get it in San Diego. That doesn't seem very efficient. Weird. So, our last unique biodiesel stop was on the way out of LA on our way back up to Portland. It was sort of hard to find anything real close to Pasadena. 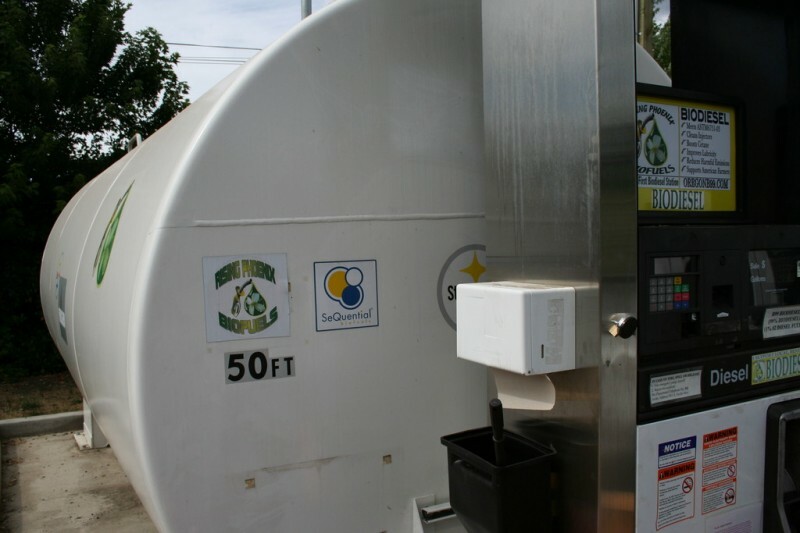 There is an LA Biodiesel Coop that has several spots in the area (and a really cool logo), but you have to be a member and it costs $250 to join! Sick! And the price isn't even that great once you're a member... more than mine costs in Portland with no membership. 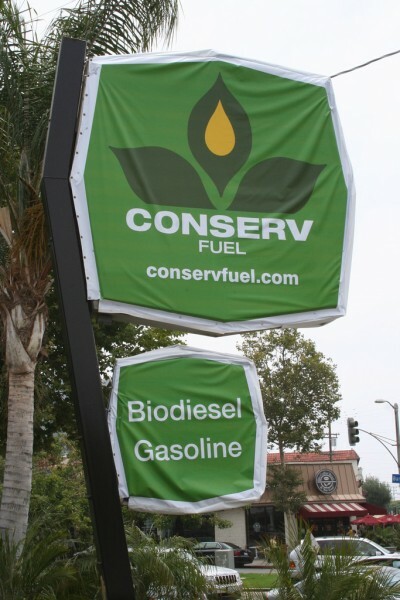 So, anyway, I found Conserv Fuel in West Los Angeles and decided it was definitely worth it to drive forty-five minutes or so out of the way to be able to make the trip on mostly biodiesel and to see another cool station. Here is one of their B99 pumps. I really like their branding in general. They have a great website. As I was looking around on the web for info about their station I found several references to an appearance there by Barack Obama . That's pretty cool. Here is the sign for the station. I like their logo. I almost forgot to mention something weird, and since there's nothing spectacular about this photo, I'll mention it here. 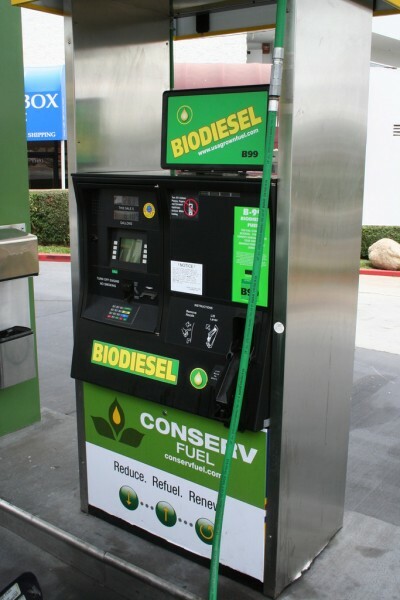 Apparently there is a law in California that businesses cannot sell straight biodiesel (B100 or B99) directly to the public. Sounds like a really dumb law to me. 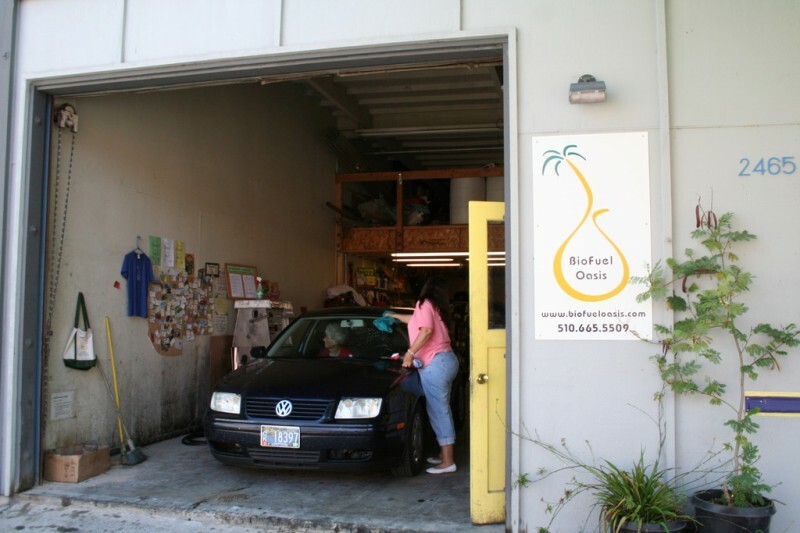 But anyway, the way they get around this is that if you want to buy biodiesel from a retail business you have to sign up for a biodiesel users group. 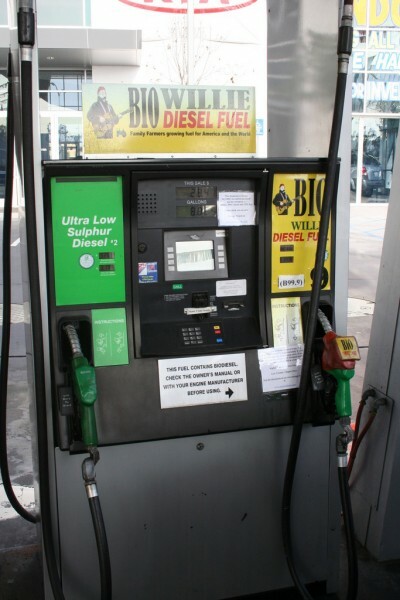 So, before I could get fuel at Pearson Fuels in San Diego, I had to fill out an application for the Southern California Biodiesel Users Group. So, if you go to their members page, you can find my name on the list; I'm number 2117. Kinda weird, but whatever works. 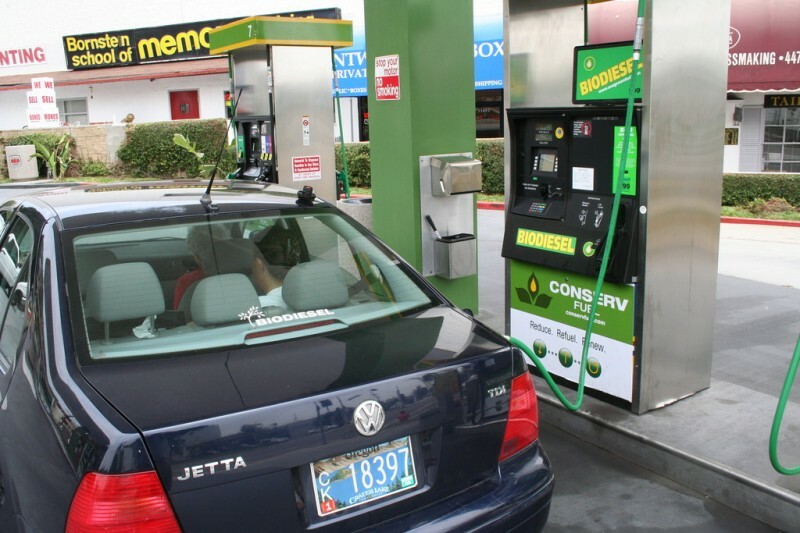 There was a sign on the pump at Conserv Fuel, too, that said to go see the attendant if you weren't already a member. I don't know why the issue didn't come up in Berkeley. This was their price list, and again, I was pleasantly surprised that the price of B99 was even lower than what I get in Portland. So, that ends the slideshow, but after this stop we drove north on I-5 looking occasionally with my mom's wireless broadband on her laptop for last minute biodiesel possibilities but finding none, until we stopped for the night in Corning, CA. There I put five gallons of dino-diesel in my car to get us by until Phoenix again. That turned out to be a pretty good estimate, so we didn't use much more than we had to, and that's not too bad. 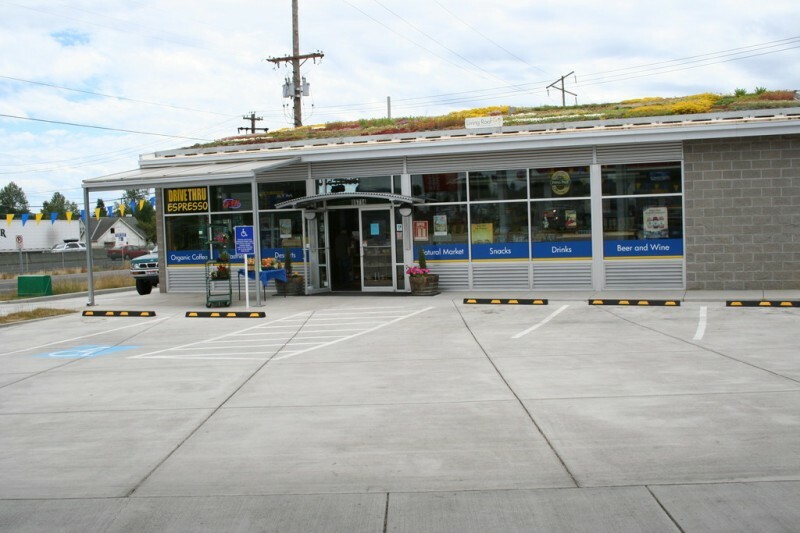 Hopefully in the future there will be plenty of retail stations along the I-5 corridor in California like there is in Oregon. Thanks for reading!